France just released its new energy strategy – the “Programmation pluriannuelle de l’énergie” (PPE) - which sets out a six-year solar tender program aiming to allocate 2.7 GW of solar capacity this year, and 2.9 GW per year for the next five years. This opens up the possibility for increasing the share of PV fivefold by 2028. The announcement has sparked great interest from both local and international players hoping to take advantage of these tenders, which have yielded record low prices up until now. If prices keep decreasing, it could remove the need for subsidies, therefore opening up the possibility for France to achieve the status of SMP. 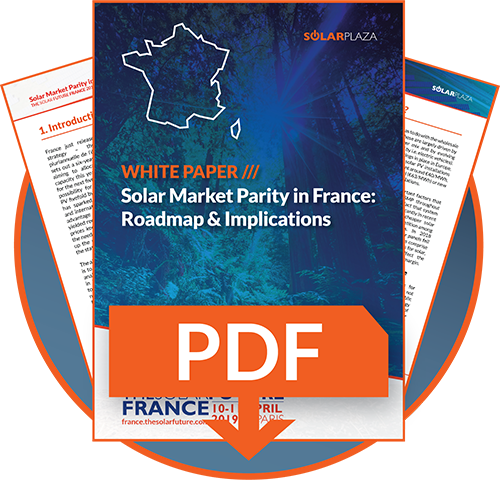 This report is part of the preparation for the The Solar Future France conference, hosted by Solarplaza on 10-11 April 2019 in Paris. With the new energy strategy for 2019-2028 as a backdrop, the high-level conference focuses on the specific economics, the investment dynamics, the future trends, and the best available outlook of the booming French solar photovoltaic (PV) market’. The event will bring together 100+ high-level attendees, including top level decision makers and key players from the investor, developer, and policy communities, to explore the dynamics, complexity and growth of the PV market in France. Complete the form below to download the report!